Discussion in 'Jacket Art / Patches - Original and Reproduction' started by CBI, Dec 17, 2011.
there are a number of references I have used including Maurer (which IS great but has some incorrect ID's BTW). The Battle Colors books are very good, cbi unit histories online etc. They are all id'd minus the 14 I just listed that I need help with. Thanks! In my younger days I owned a squadron patch collection of about 2,500 patches. Sold them all to help pay to return to college! Agree, reminds me of RKO's except these are MUCH nicer than the RKO patches and taken one at a time would be pretty hard to tell are not WW2 originals. Agree it will make a great display at the local airport. Oh, I forgot to mention I will be "restoring" the museums small collection of original A-2's. In the process of asking the families right now if its OK. I went with a wider/bolder stencil however in researching lettering and stencils from the 1930's, its all over the map with lots of homemade options even then. there are a number of references I have used including Maurer (which IS great but has some incorrect ID's BTW). I am not sure I agree that Maurer & Maurer has incorrect id's, but it does have newer emblems replacing the wartime ones. It also has a number of WW II designs that by the 1950's unit designations had change so much that they are hard to track back to what they originally were. Plus, there are some new AF units that just took old designs as there own. On top of that, it only shows the approved patches, and many units never wore approved designs. To complicate things further, some units depending on the time period, could actually have worn more than one approved design....but Maurer & Maurer will only show one. It can be a tough tool for sorting out what was going on in WW II, but I think it is accurate for it's publication date. Grumpy - yes stuff along those lines and accurate for its publication. Without going into loads of detail, when researching other patch projects there seemed to be some real inconsistencies in regards unit histories and designations compared to some other references that seemed to have been researched more completely. However, its an excellent reference and nothing is perfect - can't live without it if one is into squadron patches for sure! Some of the units that it says had no patch, did have them but again as you say, the book deals with approved patches. I agree. It would be really nice if the Air Force did an update of Maurer & Maurer. The Navy has done a nice job with the first few volumes of their Dictionary of American Naval Aviation Squadrons series....hopefully the AF can do the same for us! If you posted photos of all the patches, I didn't see a one that I don't have ID's to , please send me scans of the ones you need ID's to and I'm sure I can nail them down for you . Thatis a great bunch of patches albiet repro's , they're still really nice to see !!!!!!!!!!!!!!!!!! The Mauer & Mauer book really isn't all that bad , if you just pay attention to the "approval" dates of the emblems and follow the dates of the redesignations you can figure out if the emblem "shown" is of the WW-2 era or post war , there were as you mention a lot of "Unofficial" emblems from the various Squadrons and Groups that were used/worn but being of this nature and the AAF having the emblem "rules" they never made these books, so it's a matter of "searching " like have for the past 30 years into the backgrounds of the "Unofficial" "Unathorised" ones, and let me tell you there are a lot of them , not only in the AAF's but also the USN and USMC ! But that is the fun of this research , finding those "Gems" and nailing down what unit they were from, dates etc , i find it a very fascinating and on going hobby I'll never tire of !!!!!!!!!!!!!!!!!!!!!!!!!! I just got 2- CD Rom discs the other day from a US Navy source in Calif , TONS of GREAT color WW-2 emblems of various types, VF,VBF,VC,VT etc etc , the man that sent them made my "YEAR" in patch emblem scores !!!!!!!!!!!!!!!!!!!!!!!!!!!!!!!!!!!!!!!!!!!! What's that going to entail John- you're a talented artist but not touching up artwork I hope? Lovely piece of work John, you're an artist to be sure. Might even let you loose on my cherished GW A-1 at this rate - do you take commissions? Can't wait to see the end result. Andrew - nothing drastic in regards refurbishing. 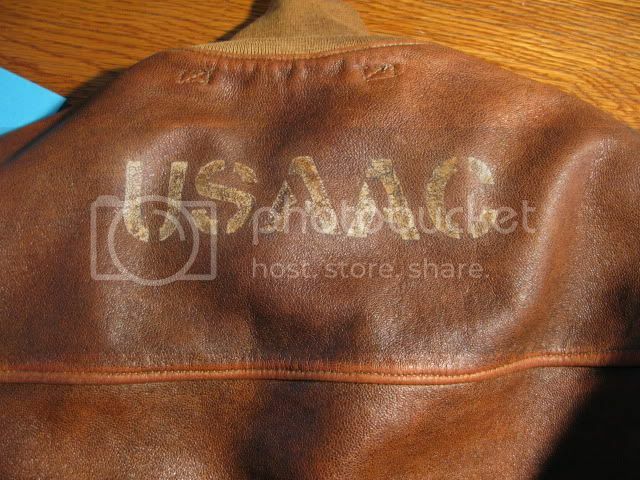 In fact, I know have one of the jackets from a 20th AF pilot. I am waiting to hear from the family who have a few questions about the jacket. I will post pics and ask you all what you think. The leather is pretty dry and I would believe a careful coat of Picards is in order at least. Ian - not sure if I am able to take any painting work at this time as I am swamped. The word is out that I did a tiny bit of work on Red Tails and I am getting a number of emails a week for painting which I am unable to do. CBI, how much to single shoot each one, I will pay for the effort, and I am sure EMBLEMHUNTER has a stiff one after seeing these. Would be a great reference for the site. 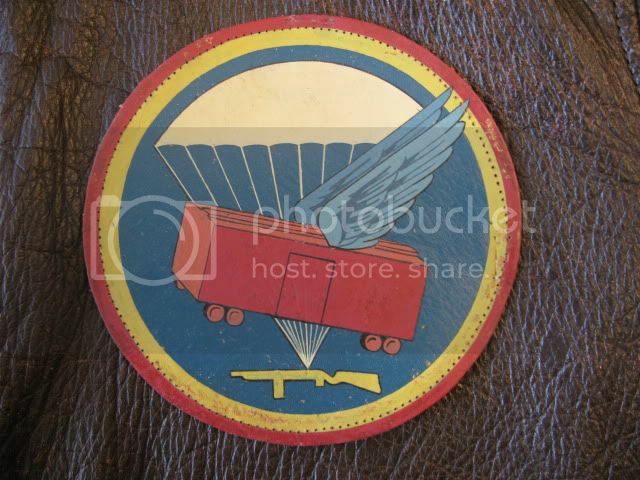 I have had a hand full of this artists patches that pop up on ebay now and then. 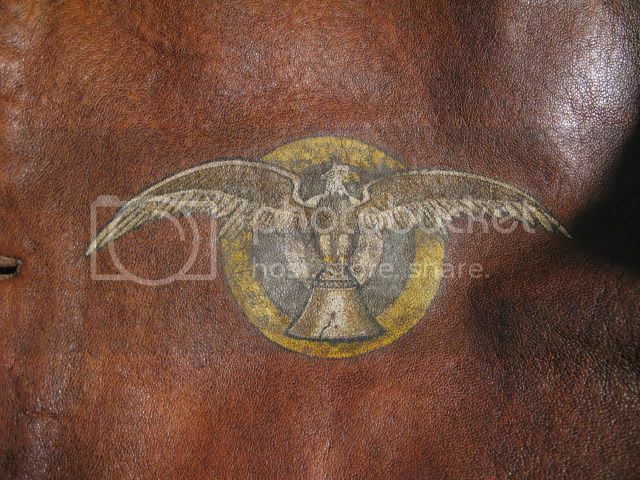 Fantastic work, usually on a very stiff leather, and for whatever reason sew wholes done as if they were used. To me the greatest patch painter, Wish I could track the artist down to find out who. They are nice to see in larger format , the Nat Geo issues had many if not all of these years ago , I found a couple of the issues , but these here are Beeeee U teee Fulllll !!!!!!!!!!!!!!!!!!!!!!!!!!!!!!!! even if they are "repros" . Any of these? My father's group. Thx for checking. Great collection! Gents - I am afraid I don't see this happening to post them all online. I am dealing with Vets, Vet families, etc. and its kind of complicated. I DID find out today that according to the person who passed the collection on to the air museum...........the collection was given to him by an uncle who says her purchased tehm in the 1950's by someone known as "the patch king" or "the patch maker". The artist's business card was displayed on a wall with a load of patches but he can't remember the name. So, we have forum guys pretty sure these were made in the 1980's and the owner saying 1950's. "The Patch King" was it for sure. They made repros for the collector market back then just after the war. Embroidered as far as I knew til now, I've had a few. There's a catalog out there and I think they even supplied Bannermanns in New York. It could that they were made in the 50s, and the artist made them throught the 80s, or what was for sale in the 80s was old stock. I have heard those names mentioned before. They look more fifties to me, but I'm no expert. Wonder what leather was used? it seams to all be very thin, and stiff.